Tricia Goyer shares how visiting orphans in Kenya broke her heart concerning adoption in her own country. Last week I was honored to go to Kenya with AWANA International. AWANA has 1,500 groups in Kenya, and they are doing amazing things. But the most amazing thing (to me!) was the work they are doing in the Kibera slums. The Kibera slums is estimated to be home to 1.3 million people, nearly half of them are children. Many of these children are orphans due to the death of a parent—many to AIDS. Yet dedicated leaders are creating schools and providing homes for these children. Because of AWANA these children know the Word of God! If you know me at all, you know that the word “orphan” captures my heart. I cannot put into words how deeply touched I was to spend time with those little children—to laugh with them, to hold them, and dance with them—and then have to walk away. These are children without parents, and there is no foster care system or other government program to care for them. They are alive and fed because godly, caring adults took them in. Can you imagine a more heartbreaking state to be in? To be unknown, not accounted for? Because the state of orphans, and adoption, is close to my heart this conversation came up with the West Africa AWANA director, Charles. “Adoption is very hard in our country,” he said. “There is a lot of obstacles. There is a lot a paperwork and there is a lot of problems with allowing adoptions to happen.” Charles should know. He’s an adoptive father of two. Charles went on to tell me that there is a child trafficking problem in Kenya and the government’s rules are trying to protect children. As a result, may children will never know a forever home. My heart broke to hear this. After being in Kenya, I know that even those who want to adopt have little funds to do so. And because of the devastation of AIDS there could never be enough adults to adopt all the children left in the wake. The average life span in Africa is 47-years-old and most people live on $1.00 a day. Finding a forever home for every child in those circumstances is impossible. Thankfully, there are loving people who don’t worry about the official paperwork. They feel God’s call and then take children in. They care and feed for those with no home and no hope. Because of AWANA they plant God’s Word deep into children’s hearts and teach them what a relationship with Christ is all about. They have few material goods, but they share all they have because of the love of God within them. As I talked with Charles I listened, I nodded, and then I felt the words exploding from my mouth. “We have a problem—a very big problem with adoption in our country too.” And then I went on to explain. “In our country adoption is very easy. In Arkansas—the state I live in—there is a foster care system that helps children. If you are a good family, you can adopt children without much problem. You have to go to 30 hours of classes. You have to allow people interview you and come into your home, but otherwise adoption is free. “There are over 500 children, just in Arkansas, who are waiting for a forever family. Once you go through the training, and your home is approved, our government even pays you to provide foster care until the adoption is finalized. These children have medical care through this state program, and other needed resources, such as therapy, is provided for. In some cases the adoptive parents will continue to receive board payment when they adopt sibling groups or special needs kids, until the child is eighteen-years-old. There are support groups to help parents and children through the transition. Our group was silent as I finished. I looked across the table and my eyes connected with Charles’. We are both adoptive parents, and both of us have broken hearts. Both of us were thinking about the children and of the problems in our own country. 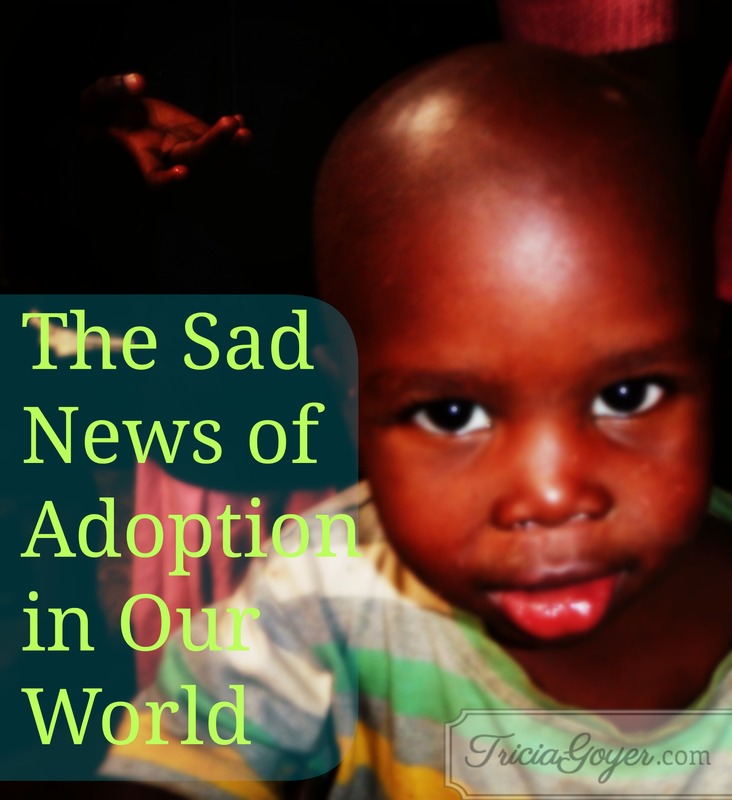 The sad news about adoption in our world is different for various reasons. In Kenya, the courts make adoption very hard, but in America the sad news is that our riches make it even harder. In America the sad news is that our riches make adoption very hard. I thought I’d leave Kenya with a heavy heart for the children there. It is heavy. But I returned with an even heavier heart for us here in our country. For all of us who are missing out because it’s so easy to look away. I cry for the children who are waiting for someone to choose him or her. They live here, too, and they know it’s not poverty that is stopping parents from coming to them. We sit inside our homes and watch our televisions and play on our computers. We have food in our cupboards and closets filled with clothes, and we find it too easy to look the other direction. It’s the most heartbreaking state I can imagine—even more heartbreaking than the slums of Kibera. Great article! Very convicting. I have to say, however, that sometimes it isn’t so easy to adopt in America, either. Several years ago, my husband and I tried to adopt from the foster care system. We went through all of the training classes and then were told that if we weren’t willing to be foster parents first, then they didn’t even have time to come do a home study on us. It was very confusing and heartbreaking because we felt like God was calling us to adopt… but I didn’t think I could handle being a foster parent. I get way too attached to be able to give kids I’ve been caring for back. That’s VERY interesting, Michelle! Thank you for telling me about that! In Arkansas parents are “foster” parents for the 6 months until the adoption is final. So we actually were foster parents before we were adoptive parents. I know every state is different on how they handle things. I remember as a child my parents taking in other children from the foster care system here in NY. It was not easy for my mom to watch kids go back to parents she knew would again suffer at the hands of their own parents. We had one little girl from birth to 3 years old, that was very hard for my mom when she was taken back to her own mother. Its not so easy to adopt here and in other states. And those of us who don’t have as much money or things, but are willing to share what we do have, are not allowed to adopt as we have no money for the fees to adopt. I watch my sister with her babies, one little girls he adopted, the boy she has from birth who is now 10 months old, who’s mom was addicted to drugs is being allowed visits and soon weekends yet she lacks the heart to be a mom. All her other kids are with her mom or others, yet she would be allowed to take this boy from my sister and make his life harder. He has all he needs with my sister, A mom , A dad, a sister, food , clothing, shelter, love and knows only my sister as Mamma. There are children in foster care here and not adopted because they do make it hard here and they make it cost so much to adopt. You are right though, some sit and have and do nothing , turn their cold hearts from doing right. Some of us cannot afford the costs and have very little but what we have we would share. The system fails children and families. Each state is different for sure, but the US as a whole has failed many. Linda, Thank you SO much for your comment!! I know there are many, many ways that people are helping children other than adoption. I’m SOOOO thankful for this!! God will guide each of us to give and serve as we’re able. He is amazing! Thanks for what you’re doing for orphans. I really admired your WWII books, and since I’ve followed you on social media for a while now, I’ve really admired you for so much more. What a wonderful story. Thank you for, sharing! We’ve adopted three children and they are SUCH a blessing to me! I know your parents feel the same! I hear your heart, but I have to disagree that riches are the problem and why children go unadopted. Sure, there are MANYmanyMANY Americans that have plenty and don’t want to invest in children. There are major emotional issues to consider that are actually life style decisions. We had a foster son and became his legal conservators nine months after he moved in with us. We loved on and love him dearly. The first three years were great, but the last three were the hardest I’ve ever walked and that is saying a lot. Reactive Attachment Disorder is a very real gig and it’s incredibly painful. We were never Daniel’s parents to him and he doesn’t emotionally connect to anyone. That is not a situation that is heal-able with money for either party. Signing up for it or at the least the strong possibility of it is no easy step to take and no matter all the money in the world, I wouldn’t do it right now. And there are many mothers and fathers who are grieving, hurting, and being judged because of how their foster to adopt or older child adoption went. I heard from many via comments and emails when I shared this post about our experience. Many states make it difficult if not near impossible to adopt small children and babies. While this sounds like older children go unloved, it’s usually more that disrupting child birth order and handling RAD or other major issues are not what the family can handle at that time. Here in NM, we were told it could be three years before they would finalize an infant or small child adoption. Three years of uncertainty and the chance that the State would come in and take the child “back”. I am not willing to walk that road and no money could change my heart and emotional make up right now. Many states put limits on family size and foster to adopt. We have six children already and NM was not willing to talk to us about infant or small child adoption (then I found out the time frame and stopped pleading anyway). We are raising funds to adopt domestically (seven months or less). We don’t make much money. My husband is a camp director for a camp for children on the autism spectrum and I am a SAHHM. Still, we want more children and have chosen domestic adoption. It will cost us $20,000 because we won’t and can’t go the foster to adopt route. Is that fair? I don’t think so either. The cost is a real hindrance to most and I sometimes fear we won’t be able to raise the funds. We are selling autism awareness shirts right now, but we will see. The lack of riches could prevent us. Anyway I believe your heart is in the right place. I, too, am heartbroken when I see couples and families unwilling to have more or adopt children when they could afford it so easily. But… I have walked a road of foster/adopt and it’s not all about riches. There is so very much more to consider when adopting from the foster care system. And I will admit that it hurts when people assume negative things about us because we won’t and can’t go that route. It’s not at all about riches. Thank you so much for sharing your heart, Mindy. I’m thankful for your perspective and I encourage pre-adoptive families to read your wise words! I am SO thankful that we live in Little Rock and they have AWESOME therapist who knew how to deal with kids with trauma. I followed their advice to the t, and it’s amazing how they found healing and wholeness. I know many families with children who had the same traumas and they are still struggling. It’s a hard, hard road. Here in Arkansas it is possible to adopt young kids, or even older ones without RAD or other issues. I know that each of us must be open to God’s unique call. He will lead us on different paths. Yet I also know that sometime we need ti give up our comfort to all HIm to work.